UPDATE (8/31/2015): A recording of Dr. Saucy's memorial service can now be viewed online. 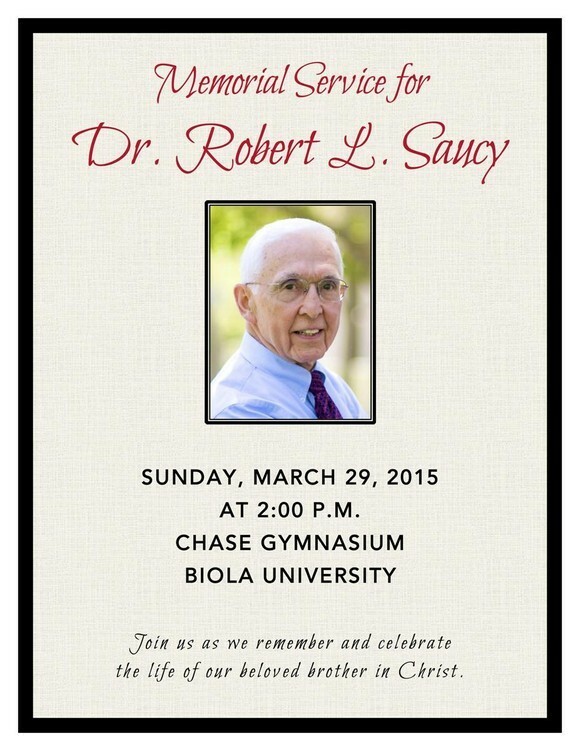 A memorial service for Dr. Robert L. Saucy will be held on Sunday, March 29, 2015, at 2 p.m. in the Chase Gymnasium on the Biola University campus. A reception will immediately follow. For those who would like to attend but cannot be physically present, the service will be streamed live. Chosen People Ministries exists to pray for, evangelize, disciple, and serve Jewish people everywhere and to help fellow believers to do the same. Awana Lifeline is a ministry to inmates and their children. Their vision is that every child would have a godly father and mother who are building a legacy of faith in Christ. If you have any questions, please use the "Comments" section below and we will respond as soon as we are able.